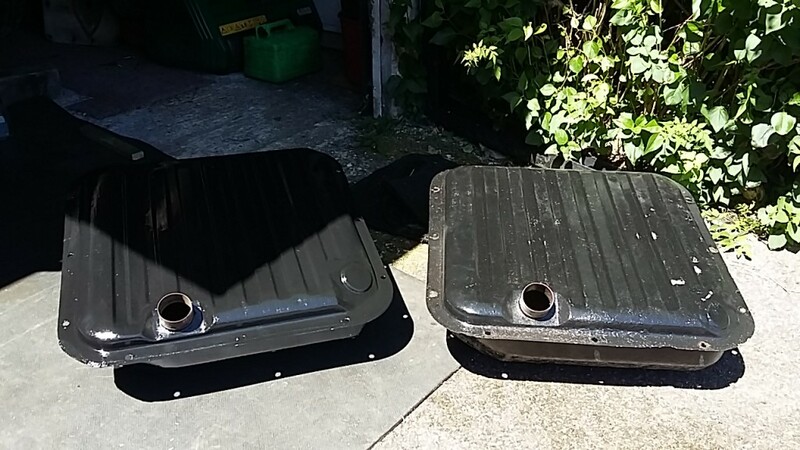 Saturday morning was when I had a spare hour and I could fit the replacement fuel tank knowing it wasn’t a too arduous task having taken the fuel tank out before. I was hopeful about the fuel sender would work that came with this fuel tank but unfortunately it didn’t. Anyway the new tank looked so much better and was much cleaner (clean metal) inside, so I transferred about 2 gallons of clean looking fuel from the old tank. That is where my glory ends. Boosted by the start up last weekend, I fired up the Corsair. A little reluctant to begin with but on the second turn of the key, it started. All seemed OK though throttle response was still a bit dodgy with its flat spot. 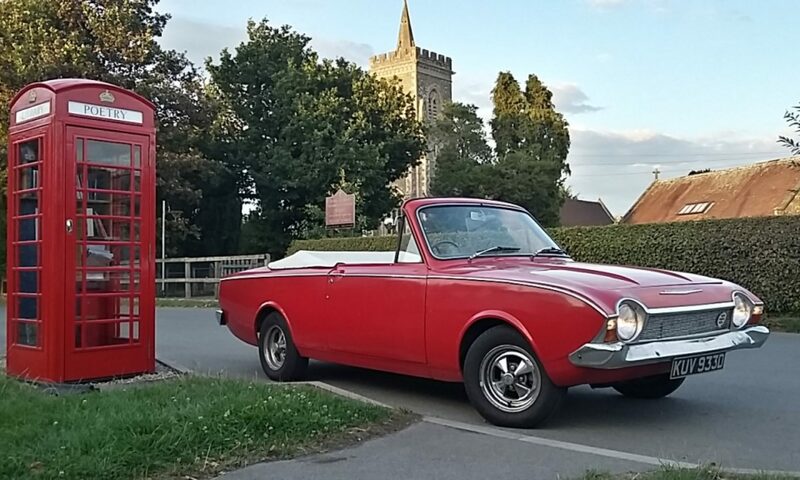 I decided to bite the bullet and go down to Iwerne Minster in the Corsair to pick up my son and give the car something of a test drive. By the time I got about a mile (and a bit) down the road, then going up the 1:10 hill out of Cann, things weren’t going so well. The poor old Corsair was spluttering, jerking and misfiring all the way up the hill. Once on the less stressful flat or going slightly down hill the Corsair was behaving only with the odd splutter when increased acceleration was required. I got to Iwerne Minster and as I pulled up the car stopped and wouldn’t restart. A phone call to my wife to come my aid was made. After a 30 minute rest, I tried the Corsair again and it started up, so my son leapt in to the Corsair (passenger seat) and we drove off. The wife was very understanding and was keeping an eye out for us in our wake. After about 2 miles and before the horrid hills in Cann I pulled over as the car was struggling again, spluttering and kangeroo-ing along the road. I chose a good shady spot at the side of the road (as per the photo). It took a bit longer this time for get the Corsair going again, so my wife took our son home and came back to my aid, unfortunately not getting my text message about picking up the jump leads until she was back with me! So I nipped home to get the other car just in case it was needed for towing as well as coming back with the jump leads. 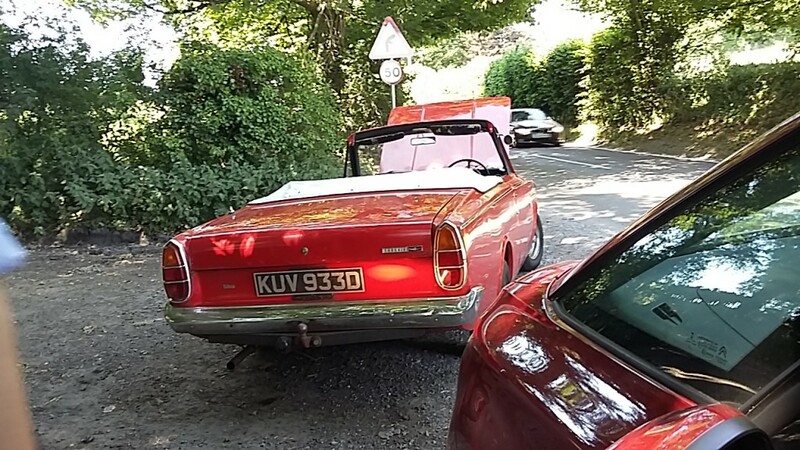 With Corsair jump started, I was off again, keeping the poor car going popping and back firing up the hill out of Cann, just about making it into Shaftesbury and thankfully with no holds up on the way home to glide in to the driveway. Home at last with just one more start up to get the corsair into the garage. Knowing I can get about a five miles with a bit of stress, I have decide to drive it to Johns at AJ Restoration rather than wait for it to be trailered there. My suspicion lie with the ignition system, whether its the coil again, condenser or HT leads or something else, hopefully John can apply his experience in fault finding the problem for me.